TARRYTOWN, New York -- The autopsies of two men killed in the collision between a tugboat and a construction barge on the Hudson River north of New York City showed they died from drowning, while authorities have called off the dive team's search for the third victim. Divers were unable to recover the body of Harry Hernandez, of Staten Island, because the damage to the tugboat is too severe for them to access the body. Hernandez will be recovered when the tug boat is salvaged and brought to the surface. The 90-foot tugboat named Specialist hit a construction barge Saturday where workers are building the new Tappan Zee Bridge. O'Leary said commercial divers went into the water on Monday to assess conditions and start coming up with a plan on how to raise the tugboat. On Sunday, divers recovered the body of Timothy Conklin, of Westbury, New York. The body of Paul Amon, of Bayville, New Jersey, was retrieved Saturday. Authorities said three tugboats were pushing a barge from Albany to Jersey City, New Jersey, when one of the three - situated on the right side as it headed south - hit a stationary barge that was part of the Tappan Zee Bridge construction project. A tugboat on the left side of the barge that was being pushed, as well as one that was pushing the barge from the rear, were not involved in the accident. The sheen from the initial diesel leak has significantly reduced, and officials say there will be a minimal environmental impact to the Hudson. 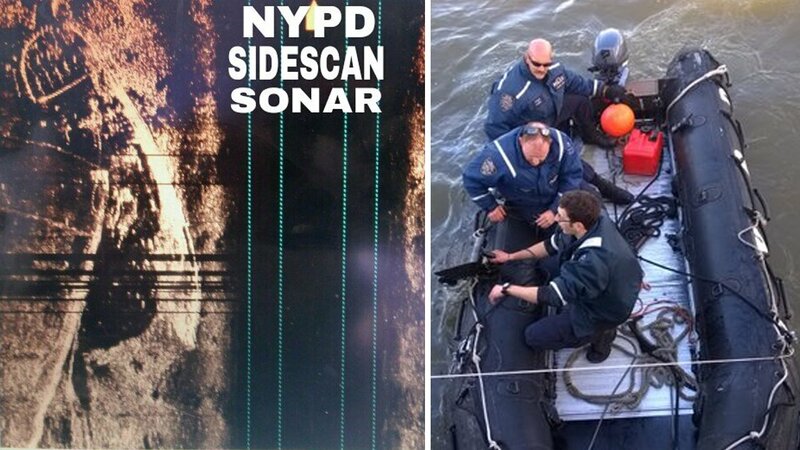 The NYPD also released a sonar photo of the boat under water.